On the evening I returned home from the 2014/2015 academic session, my mom and dad happened to be the ones at home. I met them full of smiles and joyous, cause they knew and anticipated my home coming from the prestigious Citadel FUTO after being away for months. Their ears inched for every story I had to tell, they couldn’t stop complaining about how malnorished and emaciated I looked all (You know African Parents nao). Minutes later, food arrived and they urged me “rie nri, I di ka aziza” (eat food, you look like broom stick) lol8-|. When the table was cleared off the dishes for dinner, it became very obvious that everyone expected to hear stories of my struggles, escapades and tactics.. The first statement was: my love for WRITING has grown beyond just “being in-love with words” to putting beautiful words together, making words actions, having more reasons to pounder longer and to motivate. These are to mention but a few of what set me en route for my writing spree. I started writing short notes and stories as far back as 2004. Of course I had doubts and I was forced to ask questions: “Will I ever get paid for writing?” Maybe the articles I author aren’t reward worthy (I thought). Better still, my payment was in heaven lol? For almost everything I did, I felt satisfied by the little or no payment I received because the payback always came one way or the other. We know, payments could be in various forms :D.
Considering a payment for writing: For the love of writing, buying books, spending time to read them, my experience put into letters, “yet you handout the message and knowledge for free” someone asked. Yes, i’m satisfied to have an audience that enjoys every word of my gist, understand me better and see me in a different light. These are one of the little things that kept me encouraged. I have NO REGRETS!!! But all I ever needed was a drive, I had the fire already. I waited for someone to say Chinua Achebe started just like this, if not even financial push.. but problems don’t solve themselves, do they? My Dad had his turn to voice out and what he said was: Did you learn writing from anywhere? Did you take any special classes for them? I replied no and he said keep doing what you do, how you do it, expect little now, for thy days of bountiful yields are coming”. Let me not bore you with my plenty story jorh. I wrote my first competitive story about #Emilinks #Door only to realise the rules had been switched, which affected my story. 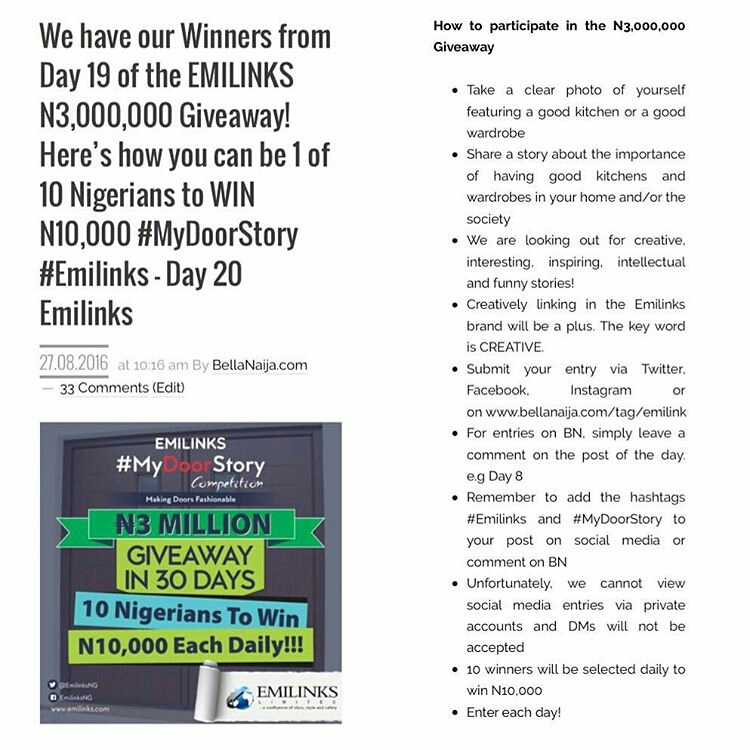 On the same day, i wrote another and a brother from nowhere duplicated my story without even changing a single alphabet and posted it for the same #Emilink #Day10 #MyDoorstory contest lol . I wasn’t nominated though :). #Day13!!!!! I wrote a new story, posted it, said my prayers and went to bed 😀 . The next morning being sunday as the mass was over I received a call from my Ugoo who said “Franklin you won! You won!”. This is the end of “my first writing paycheck” story. Competitions? bring it on, i’m already and ALWAYS. Motivated, are you? Check the the next paragraph for my own story and how you could grab you own cash. Please, tell me this door doesn’t discourage you :$. Well, that’s the door my course rep lives behind. One fateful saturday, I went to pick my textbook from him. on entering I heard overlapped chats and complains and it was about how they were robbed, I took pity on them as I saw their doors. They were worse or the same as that in my photo. He bitterly complained about how the mosquitoes, loud songs, rodents disturb them and how high their fence was and the how they took turns in checking if the compound gate was locked before going to bed, yet everyone of them was robbed. I asked “if they were securing the compound or the lives in the building?”. I told him about #Emilinksdoors and how sound and security worthy their doors are. I advised, since he was the lodge president, he’s in a better position to agitate for a change of doors, while other tenants join the bid. I thought he didn’t take hid to my advice o. I was surprised and almost laughed my lungs out when I listened to their testimonies concerning #Emilinks. Not only did the landlord change the doors to #EmilinksDoors , he changed the lodge name from “swagger lodge”, to #Emilinks villa. • Share a story about the importance of having good kitchens and wardrobes in your home and/or the society. •We are looking out for creative, interesting, inspiring, intellectual and funny stories! •Creatively linking in the Emilinks brand will be a plus. The key word is CREATIVE.